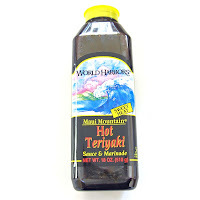 I found this bottle of "Cheriyaki" glaze, a cherry flavored teriyaki sauce, from World Harbors. It sounded SO good to me, that I had to try it with a batch of beef jerky. I put my finger into the bottle and tasted it, and WOW! It's a tart, sweet, cherry flavored sauce, that ought to be awesome on beef jerky. 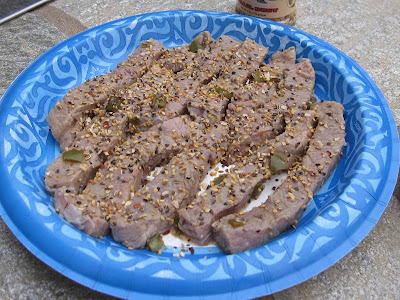 It's not a marinade, but it sounded too irresistible to not try as a marinade. 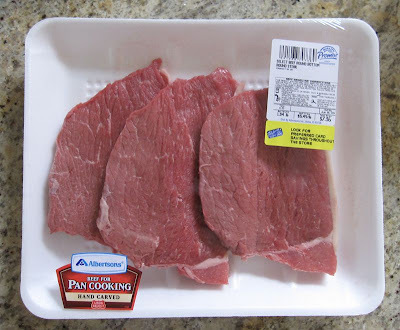 I also picked up a pound of beef top round, except this time I purchased a package of pre-sliced meat from my grocer's meat aisle. Normally, I would buy a whole slabs of top round, and slice it myself. 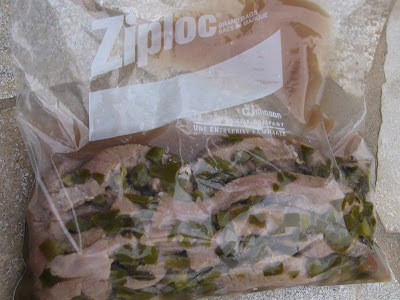 I threw all the meat into Ziploc bag and poured in about half-bottle of this marinade, and I let it sit for 36 hours. After 36 hours, I laid the strips of beef on my BBQ grill, on the upper rack. I turned the heat all the way down. In fact, I only lit one burner. Then I sprinkled on some "Szechuan Pepper" seasoning from McCormick's. I let the meat sit 7 1/2 hours. The heat from the BBQ was very slight, otherwise this jerky dehydrated mostly under the sun. 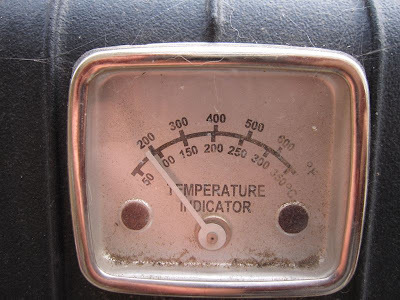 Air temperature today hit a high of about 90 degrees, but this sat under direct sunlight. Good. I don't really taste much of the cherry as I did from the original marinade. I do pick up a light fruity and tangy flavor, but it doesn't resemble cherry. As for the teriyaki, this doesn't taste like teriyaki. There is a sweetness and a light saltiness, but not what I'd call teriyaki. Perhaps I need to marinate this in straight teriyaki marinade, and let it dehydrate until done. 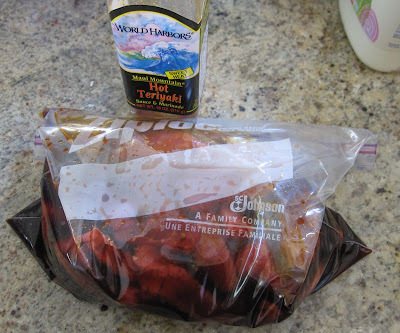 Then baste this Cheriyaki sauce on to the jerky, and let dehydrate for another hour. I love the Szechuan Pepper seasoning. I only sprinkled a little bit on each piece, using my fingers. 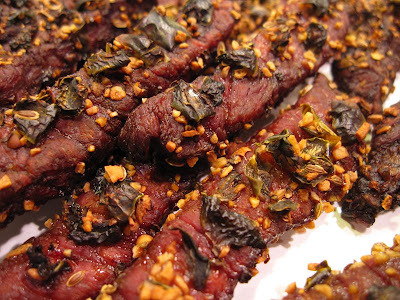 This adds a nice spicy flavor, with a little bit of hot, that seems to compliment the Cheriyaki marinade quite well. It's still very light on salt. It could use more. Perhaps I need to add more into the marinade. The natural meat flavors are light. I still can't figure out how to cultivate that flavor from jerky the way other manufacturers have done. The meat is definitely done all the way through, but not overdone. It's soft, easy to eat, and has a really nice chewing texture. 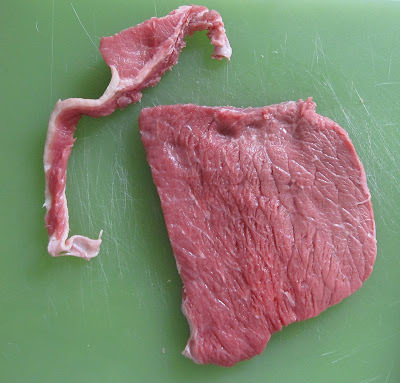 Using beef top round that was pre-sliced by the grocer is problematic. First, they don't trim off all the fat and tendon. Second, they don't slice this in uniform widths, meaning these pieces dehydrate more quickly than others. 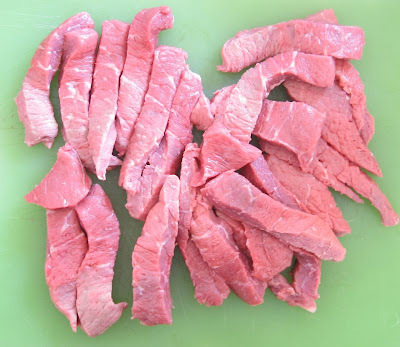 It would be better to buy slabs of top round, and slicing it myself to ensure uniform dehydration. I think this jerky came out good, not great but good. It just needs two things, one is to retain more of the tart, fruity cherry flavor, and two is to add more salt. The bonus is to cultivate more natural meat flavor. 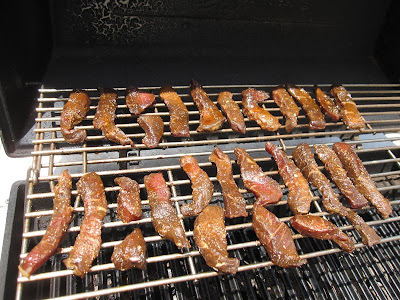 Otherwise, I'm happy with this, considering I'm still a newbie at making my own jerky. For my first attempt at making beef jerky, I wanted something spicy. These days, I like everything spicy. Whereas years ago I would put cheese on everything, these days I put chiles, hot sauce, or salsa on everything. I used bottom round. At first I looked at top round, but the bottom round looked more lean. I trimmed off the strips of fat. 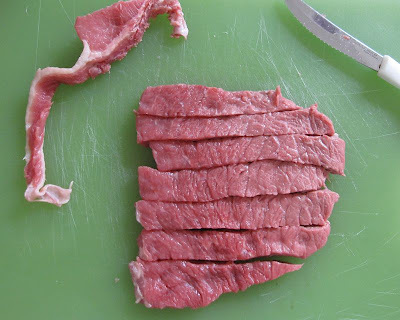 I sliced the beef into strips, cutting against the grain so that when it dried out, I could bite off chunks very easily. 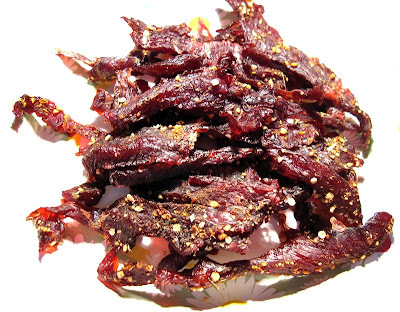 The jerky ingredients: Grizzly Joe's Trail Dust, Giuliano Pepperoncinis, Casa Fiesta diced jalapenos. 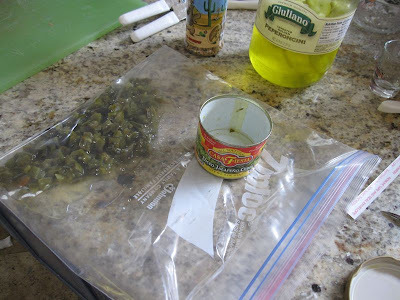 Dump all the diced jalapenos into a ziploc bag. 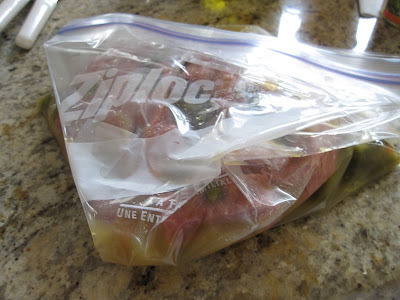 Put the beef slices into the bag. 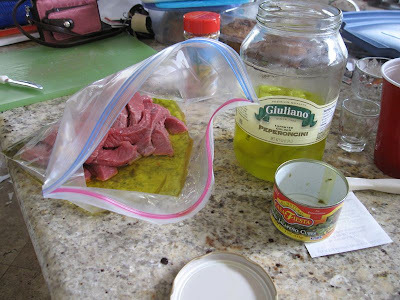 Pour the pepperoncini juice into the bag. The juice contains salt and vinegar. Stick your hand into the bag and stir up the contents really well. Let the bag sit and marinate. Most instructions I've read calls for anywhere between 6 to 24 hours. However, I let it sit for 2 hours. After two hours, this is what it looks like. The meat soaked up about half of the pepperoncini juice. I sprinkled Grizzly Joe's Trail Dust on both sides. The Trail Dust is a spicy steak seasoning. 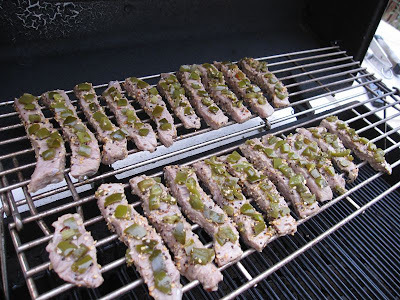 I laid the strips on my BBQ grill, and one-by-one laid the diced jalapeno chunks on each strip. Most instructions says the heat should be set to 150 or 160 degrees F. Unfortunately, the lowest flame on my grill warms up to 200F, and will go higher if I leave the cover completely closed. 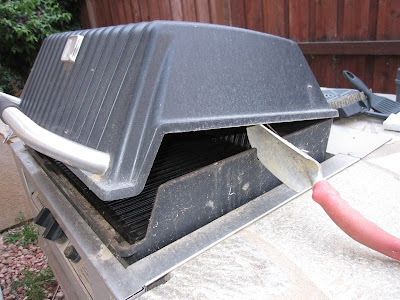 So to help keep the heat down, I used a garden shovel to keep the BBQ cover partially open. However, it didn't help enough. I could only get the heat down to about 190F. And here's the finished jerky. 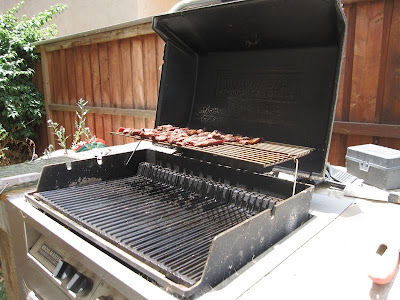 Because the heat crept up to about 190F, I couldn't keep the jerky on the grill for very long. Most instructions call for about 6 hours at 150F. I ended up doing 3 hours at 190F. First of all, I can't taste any of the pepperoncini marinade. I guess I needed to marinate longer, and use more marinade. Second, I sprinkled way too much Trail Dust. It was way too spicy, and too overpowering. For the most part, all I can taste is the Trail Dust. The meat came out soft and tender, and very easy to chew. I was quite pleased with that part. However, I couldn't taste any of the meat. The meat consistency was comparable to pot roast. I'd like to try this recipe again, except I think I'll buy a dehydrator instead. 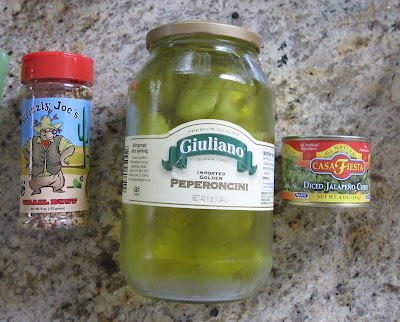 The Grizzly Joe's Trail Dust might be ok for seasoning, but I don't think it works well with pepperoncini juice. I think just some salt and garlic is all that's needed. Also, the Trail Dust is very strong stuff, it should only be used sparingly. The diced jalapenos are tasteless. 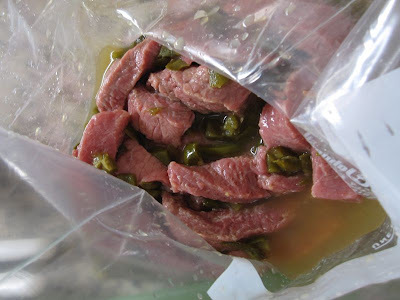 It would be better to use fresh jalapenos and puree them, and then stir them into the marinade. 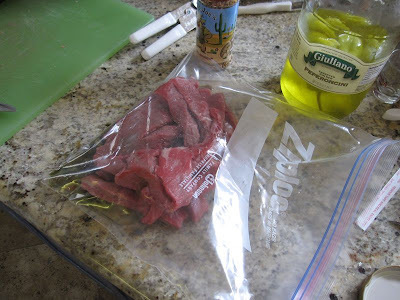 This blog chronicles my attempts at making beef jerky. 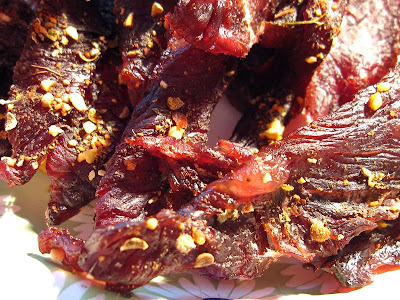 Beef jerky is perhaps my most favorite snack food. I've been eating and loving it since I was a kid. So, I wanted to try to make my own. 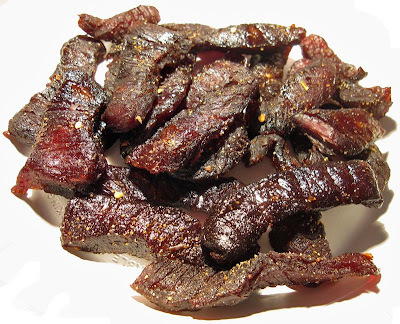 But perhaps a bigger reason for trying to make my own is because I write a beef jerky review blog, "Best Beef Jerky". 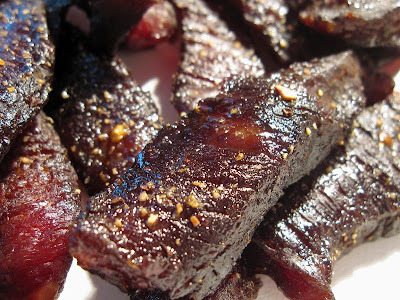 I figure by making my own jerky, I can learn a lot more about jerky, which will help me write more insightful reviews.